Gilbert Shelton will always be most famous for his irreverent take on hippie culture as beloved by stoners across the world in his Fabulous Furry Freak Brothers strips and its off-shoot, Fat Freddy’s Cat. 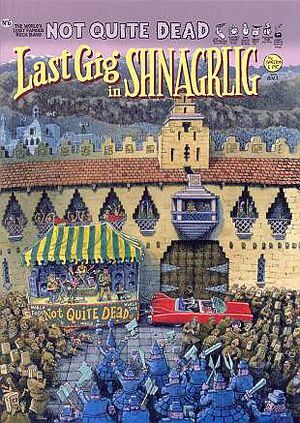 And among his other achievements – such as Wonder Wart-Hog and cover art for the Grateful Dead – there’s his ongoing adventures of Not Quite Dead, ‘the world’s least famous rock band’, who head out on their first world tour in this sixth installment of a distinctly unfabulous career. Being Shelton, the book sticks to its underground comix roots with a despicable plot by the US to use the band as a spurious excuse to invade a supposedly oil-rich nation. Of course, the bumbling members of NQD are oblivious to their part in this planned military coup. It’s pretty funny, taking pot shots at religious fanatics and American foreign policy, but if ultimately it feels fairly slight, Shelton’s art is always amusing.